This is a partial account of UCI Chancellor Howard Gillman’s talk to the Retirees Association on May 5, 2015. The Bright Past part of the talk. UCI now has 41 members of the National Academy of Sciences. It also has 33 members of the Academy of Arts and Sciences. We were again ranked the top public university in the United States under 50 years of age, for the fourth year in a row. Since we celebrate turning 50 this year (founded in 1965), we now have to be compared to all other universities. Our Law School is now accredited and has had the finest launch under Dean Chemerinsky. We have attained a top 30 ranking in law schools. Better though, we are the seventh most influential law school in publications. We are engaging all the students in “Luminations” in art and culture events. We now have 31,000 students. Our popularity grew to 88,792 freshman applications this year, and increase of 7.7%. We also had a 7% increase in African American students, and an increase in Latino student applications. It was the second best increase in Latino student applicants among UC campuses. Half of our students are the first in their family to go to college. We educate more low income students than the entire Ivy League. In reaching to our Brilliant Future, we are engaging in inter-school collaborations. Among these are UCI Water, and UCI Ocean. We want UCI to make a difference at the global level. The campus should grow to 40,000 students. We should explore new modes of teaching. UC Irvine now gives more on-line credits than the other UC campuses combined. Some Master’s programs may be on-line. UCI should at the same time increase its research by increasing its research funding. We currently get $300 million a year for research funding, despite tight federal funding. We should increase the impact of our work to society. We need new models for new programs. We receive $78 million in philanthropy, and should be able to bring in more funds in this high entrepreneurial region. Chancellor Gillman has a $200 million goal for private funding. The place to look for idealistic and commuted people for human progress is at universities. In an answer to a question on the high cost of tuition (about $12,000 a year), Chancellor Gillman stated that our tuition is much loser cost than private universities. The reason for the tuition increases is a lack of state support. Half of a billion dollars has been taken out of the systems budget. It is as if the system added another UCLA and UC Berkeley without an increase in funding. Most students don’t pay the sticker price of full tuition. More than half don’t pay anything if their family income is below eighty thousand a year. Those with family incomes above $167,000 pay the full rate. The average student debt on graduations is $19,000. Forty percent of our students are from low income families. We have the best system for low income students. Our system is better than what the federal system will propose. An audience comment was that we should raise funds for a building for the school of law. The same commenter asked us to consider more medical services on campus. The Chancellor answered that the Affordable Care Act would lead to us getting a bigger footprint across Orange County. We will partner with Primary Care doctors. There may be a clinical eye institute on campus. We should examine what other clinical space there may be. Human health and wellbeing are among the most important work being done. Biomedical sciences will be coupled with engineering and physical sciences for work in this area. When asked about assistance to the middle class, he said that Sacramento is providing middle class scholarships. Foundations are providing assistance in STEM areas. 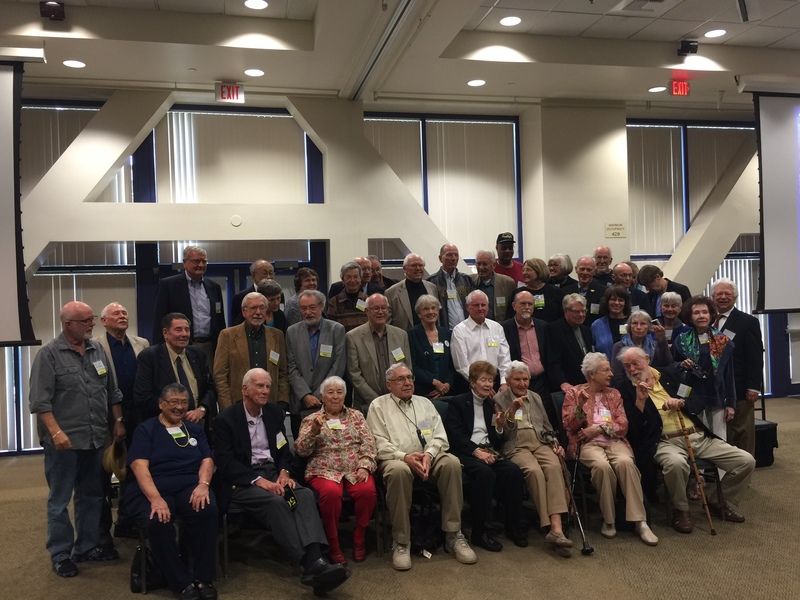 After the talk, the Retirees Association took a group picture of the campus founders that were present. Since the campus started in 1965, fifty years ago, they now consider founders as those that arrived in the sixities. Here is my iPhone portrait of the group. This entry was posted in UC Irvine, University Funding. Bookmark the permalink.